Blue Raster partnered with Greenpeace and Global Forest Watch (GFW) to help protect one of the world’s most fragile ecosystems: forests. Their threat from fires and deforestation has been characterized by some as one of the worst environmental disasters in recent history. Fires across Indonesia have far-reaching effects on both air pollution and climate change while deforestation depletes the natural forests and changes landscapes for years to come. 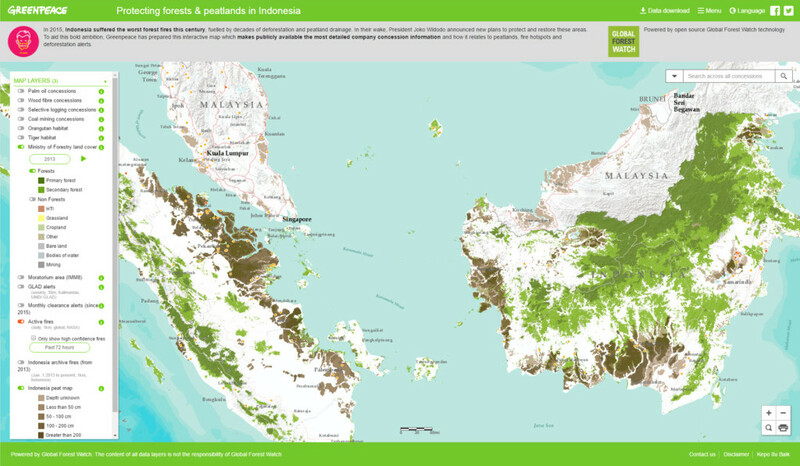 The Greenpeace Indonesia mapping application fuses the most helpful datasets together and makes them available to the public. Datasets include: detailed concession information including forest cover, fires instances provided by NASA’s Fire Information for Resources Management System (FIRMS), and selected animal habitats. Greenpeace Indonesia allows decision makers to accomplish ambitious goals by getting the latest data in the hands of the public: especially in the hands of people who can act on it. The Energy Desk at Greenpeace further describes the mapping app in their post, “Investigation: Mapping Indonesia’s fires and logging rights”. Additionally, Channel NewsAsia suggests in their publication, “Greenpeace Indonesia launches map to track haze-causing fires,” that the map can be used as evidence in court — this is certainly a game changer.